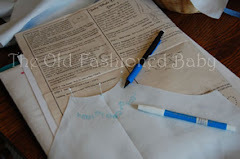 The Old Fashioned Baby Sewing Room: Lesson 4: Sew Priscilla Daygown/Best Thread and Needle to use. 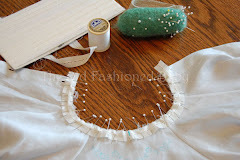 Lesson 4: Sew Priscilla Daygown/Best Thread and Needle to use. Today we are ready to sew! We are making the Priscilla Daygown, View 2. We will complete Steps 1 and 2. I have all the materials for my daygown in a project box. This helps me keep everything together so I don't have to go looking for pattern pieces or other materials I will need for this project. 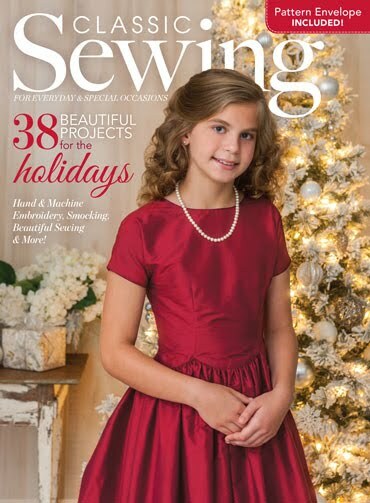 This is very helpful for a person who is always misplacing things or someone who can only spend short amounts of time sewing. Just plop everything in your project box and pick up next chance you get. Everything is just waiting in the box for you. I have many project boxes because I always have several garments in progress. The secret to success is to never "borrow" from any box. DMC #50 Thread is great for construction. 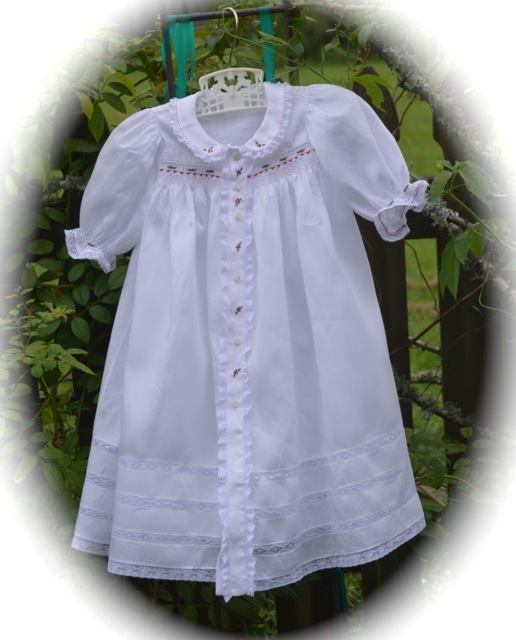 I will use 100% cotton DMC #50 weight thread for sewing my daygown. 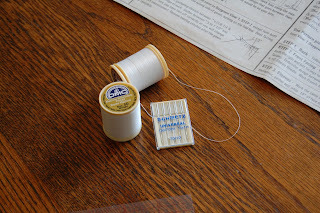 The same thread must be used in the bobbin too. 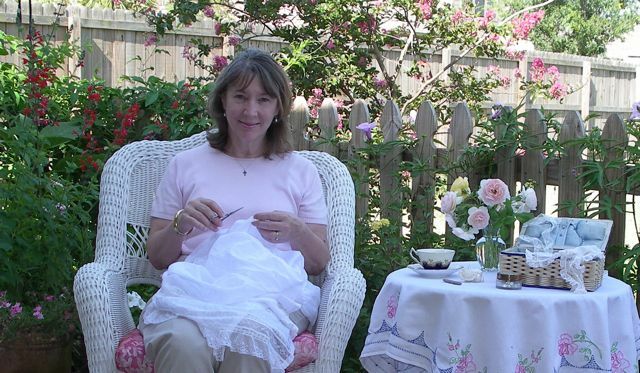 The lawn that I am using is very nice but not super thin and it is fairly closely woven so I will use a #70 needle. It is a good idea to use a new needle for each new garment you make. 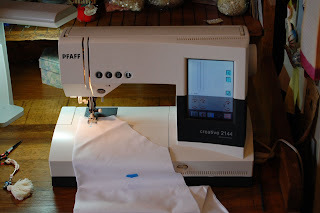 I am sewing on both my old Bernina and a Pfaff Creative 2144 Sewing Machine. Very nice! Step 1. 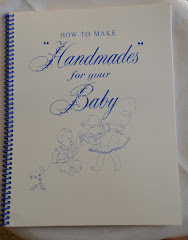 Follow the instructions in your pattern guide. 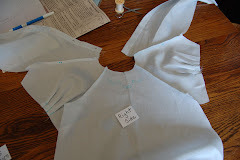 We will sew the back inverted pleat. Remember, right sides together! I always backstitch at the beginning and the end of my seam so my threads do not come undone. Close up sewing my back inverted pleat. One feature I love on this machine is the 'Needle Down'. When 'Needle Down' is activated the needle will always stop down in the fabric. Then I can lift up the presser foot if I need to re-adjust the fabric and the needle will stay in the right place, ready to sew again. If you have this feature on your machine, use it. 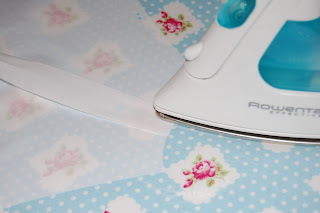 It's more fun pressing on a pretty iron board cover!! 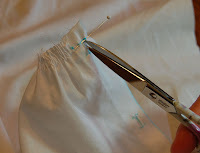 After stitching the inverted pleat, bring the center back to the stitching line to form the pleat and press in place. Then stitch the pleat down. The pleat is on the wrong side. Right side of back is shown. 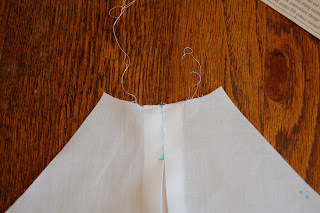 Be sure to stitch inside the seam allowance (1/4" for the neck) when stitching the pleat in place so it won't show when the daygown is finished. Step 2. 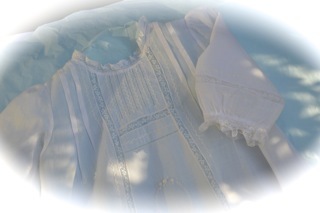 We will turn the front facings to the wrong side of the daygown and stitch them in place. Score or finger press the fabric in place using your thumbnail. Turn the facing to the wrong side along the outside fold line and finger press. Turn the raw fabric edge in to meet the outside fold line, turning it under to finish the raw edge. 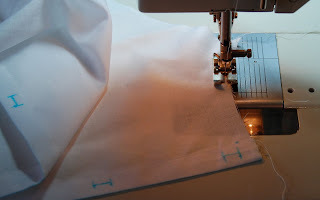 This is the same as turning the fabric on both fold lines that are marked on your pattern but this way I only need to mark one fold line and it is much quicker. The next step is to stitch down the facing. I have to decide if I want to embroider the facing before I stitch it down so I can hide any knots or wait until the facing is stitched and the buttonholes are in. This is easy for me! I always wait! 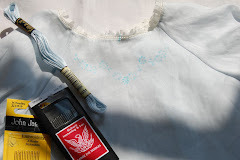 I want to make sure my embroidery is placed exactly where I want it and the easiest way to insure this is to embroider after I am done with the buttonholes. Plus, I haven't decided what I am going to embroider! Edge Stitch Foot on the Bernina Sewing Machine. Stitch by machine along the outside fold of the facing. Sometimes I stitch the facing down by hand but on this daygown I will stitch it by machine. 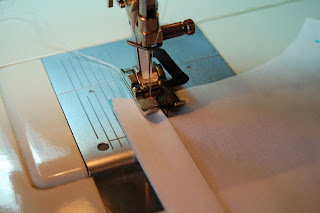 It is easier to stitch perfectly straight using an Edge Stitch Foot. Each machine has it's own type of Edge Stitch Foot so ask your Machine Dealer if you don't have one. This is a foot worth owning! Next I will sew my buttonholes. I always want to make my buttonholes before I finish the neck edge. The fabric feeds so much better. I will starch and press my fabric before I mark and stitch them. 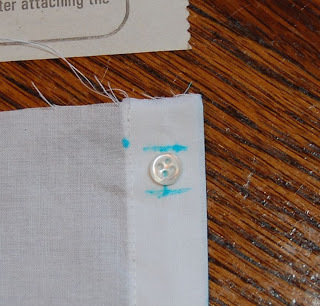 I use a button to mark the buttonhole so it is the right size. The opening for the buttonhole should be about 1/8" bigger than the button. 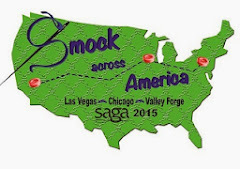 Mark all buttonholes the same size and be sure they are in the center of the Front Facing. My original marks are often not in the center so it is important to check that. 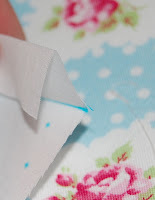 I will also put tissue paper under my fabric as I stitch. This will help the fabric to feed smoother. 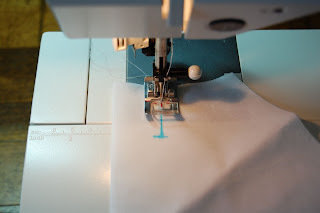 Make the machine buttonholes following the instructions for your Sewing Machine. 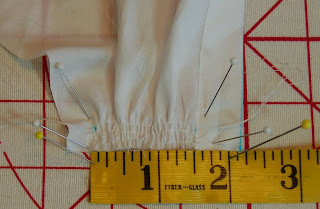 If possible, adjust the stitch width so it is a little more narrow since we are making baby buttonholes. 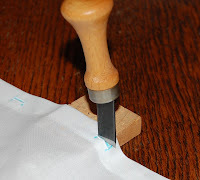 I use a Buttonhole Cutter to cut my buttonhole. I like the way it gives me a clean, straight cut. If you use scissors instead, you might want to put a straight pin across the bar to help prevent cutting right through the end of the buttonhole! Stitching a gathering row with my Straight Stitch Foot. Next, stitch three rows of gathering stitches as indicated on the pattern. The gathering stitches will be stitched between the dots on our fabric that were transferred from the pattern. I use a stitch length that is long enough to gather but I don't want it to be very long. The shorter the stitch length, the smaller and nicer the gathers (I used a stitch length of 2.5). Notice my Straight Stitch Foot. My very favorite foot when sewing baby clothes! You need this foot! It only has a tiny hole for the needle so it holds the fabric better and helps it to feed smoother. This is so important because we will be stitching close to the edge of the fabric both when gathering and stitching tiny seams. 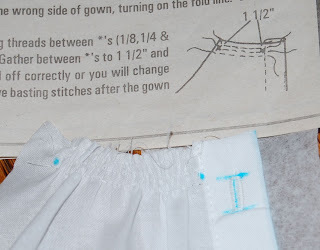 I pull my gathering threads up to measure 1 1/2" as indicated in the instructions. Gathers are pulled up and tied off on both front pieces of my gown. 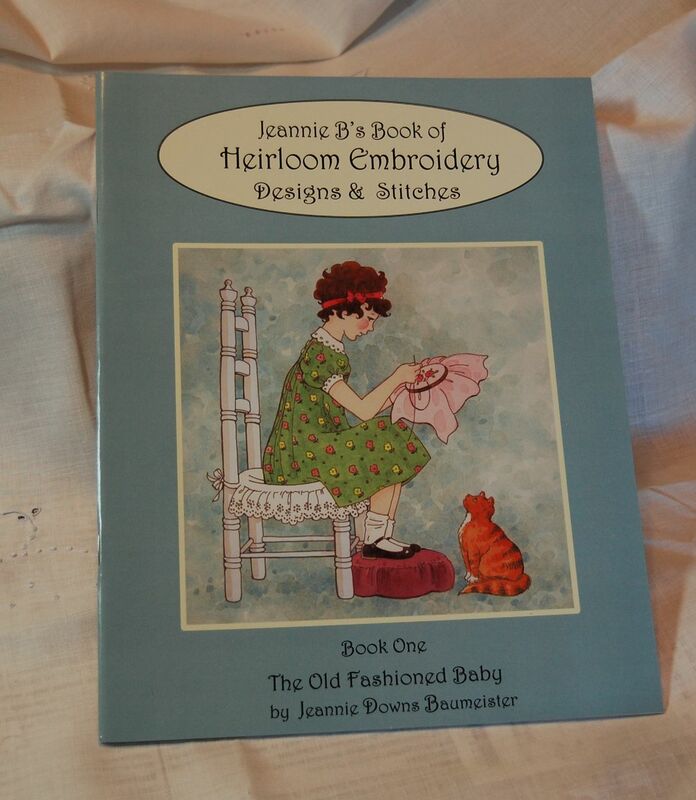 I have been looking through my Embroidery Book and thinking about what I am going to do for embellishment. I have a few ideas but I have not made up my mind for sure. 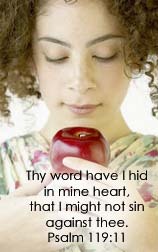 I might know by our next lesson. That's it for Lesson 4. 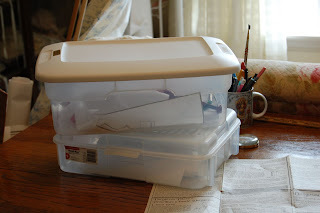 Put all of your materials back in your project box until you are ready to work on it again! You make me want to make another one...:) I am enjoying these Priscilla daygown posts and thank you very much for the link to my shop! Very beautiful project. I could not tell if when putting the gathering stitches in, if you gather up the top thread or the bobbin thread? Or does it matter? 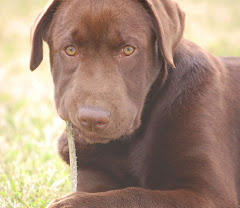 So enjoying reading your blog and seeing your fabo garden pictures. I have not found that it makes a difference using the method and fabrics that I do, so I don't pay attention to which thread I pull. And I get great results! On a good Sewing Machine, in good working order, the top thread and the bobbin tension will be even. I am using a stitch length that is not very loose because I want the control it gives me. This applies to lightweight baby clothes, which are easy to gather. The standard practice is to pull up the bobbin thread because it is looser and will gather easier, reducing the chance of breaking the thread. And If your machine works better by pulling the bobbin, do so. But keep your gathers tiny for baby clothes. 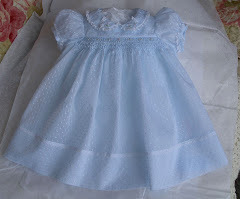 What size baby will this daygown fit? Priscilla's Layette fits up to 18 lbs. For most babies that is 6 months.